The Glock 40 Gen 4 chambered in 10mm Auto features a full 6 inch barrel for increased velocity and enhanced ballistics. 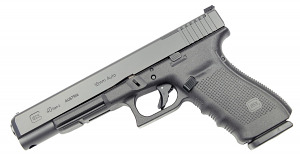 Powerful, yet carried easily, the Glock 40 in the MOS configuration is an ideal backpacking or defensive pistol for the outdoorsman and hunter alike. The Modular Optic System allows the shooter to mount the red dot sight of their choice quickly and easily with minimal tools. Four adapter plates are provided as well as a cover plate when no optic is mounted. Comes with additional backstraps, 3 mags, case, manual and lock.